SARTELL, Minn. — Armed with loppers and sledge hammers, a five-member Conservation Corps Minnesota & Iowa crew drove sharpened lengths of willow into a thick, coconut-fiber net. When the willows take root, they’ll stabilize a 600-foot-long stretch of riverbank at Mississippi River County Park. The Brainerd-based CCMI crew members finished their service term in mid-December with a better chance of finding jobs in natural resources. This year in Minnesota, 555 CCMI crew members — including 326 AmeriCorps crew members ages 18 to 25 — worked with about 250 agencies on 399 conservation projects. CCMI crews installed rain gardens in the Twin Cities, cleared downed trees on the Sand Hill River in Polk County, suppressed wildfires on 24,400 acres across Minnesota, and assisted with hurricane relief in Puerto Rico, North Carolina and South Carolina. Crews gain training in wildland firefighting, prescribed burns, chain saw use, heavy equipment operation, pesticide application, first aid and plant identification — training that would cost potential employers time and money to provide. Those who work 1,700 hours receive a $1,355 monthly stipend and a $5,920 education award. Agency contacts often lead to jobs. Agencies gain an efficient, economical labor source. The Minnesota Board of Water and Soil Resources’ annual appropriation of $500,000 in Clean Water Funds pays for CCMI crews’ labor costs. Local government units submit applications for work projects, and often provide matching funds. This year, CCMI crews worked with 35 soil and water conservation districts on 41 projects. “It’s been a huge help for water quality in the state because many of the partners we work with — SWCDs and watershed districts — tell us this is work they need to get done but just don’t have the staff or funds,” said Brian Miller, St. Paul-based AmeriCorps program director. Stearns County Soil & Water Conservation District staff oversaw the project at Mississippi River County Park, where erosion had undercut the riverbank. The work is funded through a $218,000 Lessard-Sams Outdoor Heritage Fund grant. The CCMI crew helped with labor. Construction costs total about $137,000 to date; work will finish in the spring. Stearns County Parks Director Ben Anderson estimated 10 to 15 feet of riverbank had eroded over the past decade. The undercutting created a potential hazard. 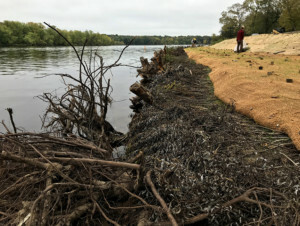 “The project is twofold in that it is stabilizing the bank and decreasing erosion, but also is going to provide a better opportunity for people to fish from shore and will provide better access,” Anderson said. The CCMI crew worked on the riverbank for a week in October. Three weeks earlier, a private contractor had created a footing in the river channel and placed 15- to 20-foot logs on the riverbed. Workers positioned upstream-facing root wads on top of the logs to divert streambank-carving water and cut the velocity. They created toe wood benches — layering jute and coconut fiber-wrapped soil lifts with brush “mattresses” of willow, dogwood and alder that will take root. The final soil layer was seeded. A final planting of native grasses, wildflowers, trees and shrubs is slated for spring. Well-placed boulders will make shore fishing easier. Anglers might have better luck, too; the rock veins create scouring that makes for good fish habitat. West Central Technical Service Area staff designed the project. Through Great River Greening, the Anoka Sand Plain Partnership coordinated the Outdoor Heritage Fund grant. A Minnesota Native Landscapes crew completed the bulk of the construction. The CCMI crew and Stearns County Parks employees finished the balance of the work. The project extended 300 feet in both directions from the boat landing. In a separate project, Anderson said the parks department and Minnesota DNR planned to improve the boat landing next season. The Minnesota Board of Water and Soil Resources’ mission is to improve and protect Minnesota’s water and soil resources by working in partnership with local organizations and private landowners. 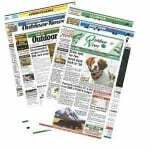 www.bwsr.state.mn.us.